Those who design malware, viruses, etc. know one of the best ways to infect a computer is through the web browser. After all, there are literally thousands if not millions of people surfing the web each day. So what can you do to defend yourself? A: Stay away from questionable sites and B: Patch you browser and all your add-ons. If you set you computer is set to “Automatically Update Windows” you get all the latest patches for Windows. 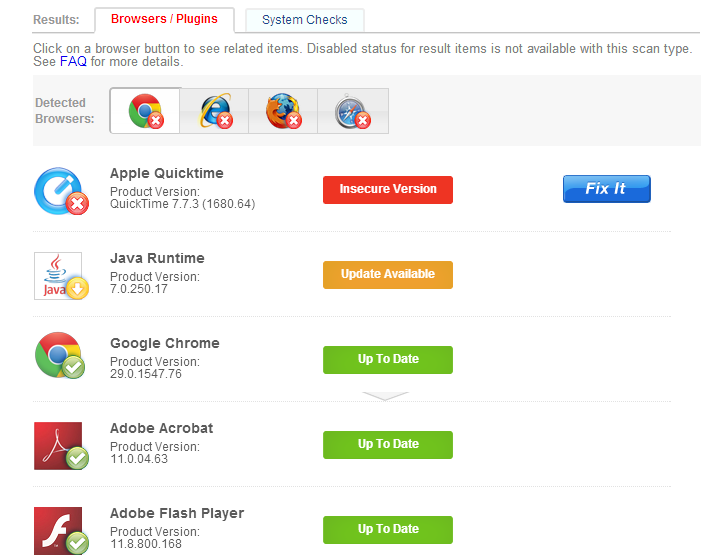 But unfortunately, it doesn’t do anything for your add-ons and you non-Microsoft browsers such as Chrome or Firefox. Fortunately, there is an easy way to see if you have everything up-to-date. 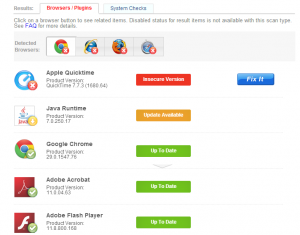 I have been using Qualys Browser Checker and it has been great letting me know if there is a newer version of a browser out there as well letting me know there are updates to Apple Quicktime, Java Runtime, Adobe Reader, Adobe Flash….and more. In most cases, if you need a update, all you need to do is click on the blue “FIX IT” button and it will either take you to the site to download the update or it will run the update for you. There are times you are taken to a site, such as Chrome, and it will tell you that Chrome is set to update automatically and you just need to wait for the update to be pushed out to your computer. While patching does not guarantee your computer will not be infected by a website, but it can prevent some infections and can limit the damage done by a virus.